The Fountain Beach Resort specializes in family travel but its meeting and conference facilities are also just right for small groups. Our exceptionally large suites, all designed differently, feature striking vistas overlooking the ocean. Enjoy spacious living areas, resort kitchens and luxurious bathrooms with whirlpool spa tubs. Standard rooms offer 2 queens, or a single queen and/or king size beds, resort kitchens and private baths with standard shower tubs. Watch the sun come up over the sparkling Atlantic Ocean from your private oceanfront balcony and relax at the day's end with the glow of the setting sun. Our beautiful oceanfront pool with sundeck, hot tub, restaurant, Tiki Bar and local entertainment is perfect for your weekend "get-a-way"! Join us for the "MINI-VACAY" so that you can face Monday again! The Oasis Restaurant & Tiki Bar is located oceanfront on our beautiful pool deck. Sitting between our band stage and hot tub, you decide how you want to enjoy those cold drinks in "HOT DAYTONA". Join Brad and his staff for some awesome local entertainment (schedules vary during the year). Bring your group down to relax in the hot tub. 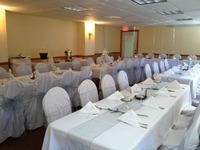 The Fountain Beach Resort comfortably hosts meetings for around 50 people. These include youth groups, senior groups, religious groups, business groups, and military groups and more. Our attentive meeting staff helps make every meeting a success. Facilities include reception and banquet rooms, classroom and theater configurations and dining arrangements suitable for everything from a cookout to a formal banquet. We are located just 2 blocks from the Boardwalk and Main Street pier where you can find shops, restaurants and the 'Ocean Walk 10' Movie Theatres. We are just 3 blocks from the Ocean Center. If you are in town for a convention, this is where you need to be. Our Night Auditor Juan cuts his hair for Locks of Love!